Chances are that you will bob your head to the mention of "Mera Babu Chhail Chhabeela Main to Nachoongi" or jump off your chair to break into a jig for a "Dama Dam Mast Qalandar". 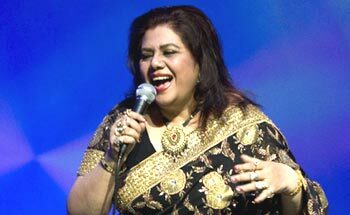 Bangladesh based singer Runa Laila, who made these songs popular and many others, is back once again in India with 'The great big Punjabi wedding'. On this elaborate concept album, the veteran singer is crooning some fun-filled Punjabi tracks which she recently recorded in Delhi. Music Today had approached me for this project; I really liked the concept because I had never really done wedding songs. I requested them to send me a demo of the songs. Right, but the traditional Punjabi wedding songs which are normally sung at wedding functions, are very different and were something I had not done before. I liked some of the tracks that Music Today had sent me. We selected a list of eight tracks, and then I came to Delhi and recorded the songs. I believe you must have come to India after a long gap? Are you following the Indian music industry? Do you listen to the music that is coming from the present generation of Indian composers? As a matter of fact, I do follow. Is there anybody from the present lot that you like listening to? Yesâ€¦ of course. A R Rahman is one of my favourites. I like Ismail Darbar, Shankar Ehsaan Loy and Vishal -Shekhar as well. So you enjoy the hip contemporary music that has been largely coming out from Bollywood? Yes, for instance, I like Pritam a lot â€“ I really enjoy listening to him. But when you did playback singing for some Indian films, the music of those films was very different. True â€“ but times have changed, trends have changed and people have also changed. Films are being made differently. The plot, the scenes are quite different and songs are being composed according to the taste of the audience â€“ whatever the audience wants - that's what is being made. I think some of the work is extremely good content wise. I would love to work with the new generation â€“ they are very innovative. I came across a write-up which said you can sing in 17 languages?!! Really?? How do you manage to sing in so many languages? Well, since I was a little girl, I had a flair for languages â€“ I liked picking up different languages. I was brought up in Karachi, my father was a civil servant, so when I grew up, I learnt Urdu, English and also Hindi. I had this passion for picking up songs for different languages â€“ that was like a hobby â€“every time, I heard a song of a different language, I would try to learn it â€“ so that's how I learnt. So musically, I know all the regional languages like Punjabi, Gujarati, and Sindhi. As for other languages - I just pick up the song and learn. You also have a Guinness record for recording the maximum number of songs in a day? Yes... that happened quite a long time back. I was recording in Mumbai for company called Concorde and we were doing different types of songs like ghazals, geet and semi-classical songs. We had some 40 songs to be recorded (for four albums), out of that I sang 30 songs in three days. Do you plan to tour India? Not soonâ€¦. but I will be performing a couple of songs from this latest album at the launch. Some composers in India have come out in the open against singers from across the borders who work in Bollywood â€“ in your time, did you experience anything similar? Honestly speaking, I have been coming to India since 1974. From then, till now â€“ I haven't faced any of that. As a matter of fact, I have been welcomed with open arms. People have showered me with a lot of respect for me and my work. I haven't faced any such harassment or been in a situation where people have said anything to me. It's been a long time since you sang for Bollywood. Did you consciously choose to stay away? What is the reason behind this long gap? There isn't any particular reason, but I think the main problem was â€“ that I was living in another country- I was in Bangladesh. You know how the music industry works â€“ you have to be present, and be constantly around. For instance, if a composer wants me to sing a song tomorrow â€“ they'll have to first make arrangements, take permissions etc. So even though a lot of composers want me to sing and collaborate, and even though I am very keen, many people back off because the process of bringing in artistes from another country is tedious. When I did playback and concerts in India things were very tough. There were a lot of permissions that had to be taken. Though now it has become a lot easier â€“ I was probably one of the first foreign artistes to work in India â€“ it was quite difficult at that time to come and go as and when I wanted â€“ that's why there was this gap. Do you tour frequently now? Yes, I do a lot of concerts in Canada, America and the Gulf countries. You are one of the few artistes to have sung for music industries in India, Pakistan and Bangladesh. How do you feel about this?